Robin Nolan is a very active member of the gypsy scene in Amsterdam. He started there busking on the famous Leidseplein and since 2000 he is also very busy promoting gypsy jazz music with his blog and his educational material (www.gypsyjazzblog.com). 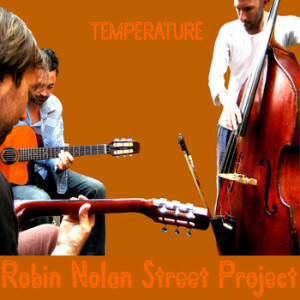 His holiday gift to all the friends and lovers of gypsy jazz music is a free CD giveaway of his 2007 album “Temperature” which was recorded after “doing a lot of ‘busking’ on the streets of Amsterdam” on one afternoon to “capture the magic on tape”. My name is Michael. This is the first entry in my blog about jazz music. I’m planning to write (hopefully) once or twice a week about jazz, presenting jazz tunes I’m listening to or CDs I recently bought, musicians that I have seen live in concert or about my own endeavors in the world of jazz. So how come I’m writing here? The answer is rather simple: I’d like to write down my thoughts and impressions about the tunes I’m listening to or concerts I have seen and share my ideas with you, so that I will not forget what I was thinking at that time and hopefully get some feedback. It should be like little diary for me to find the thoughts from earlier days again.